Training notes from the week and a little bit on how my activations and body tempering have helped me stay loose. This week starts the next 4 weeks of training: 2 weeks of heavy work and 2 weeks of volume. Here are the highlights so far. * Safety Bar squats to a medium box (basically a parallel box with a 1 inch squishy pad on top). 200 lbs. of bar weight and 100 lbs. of chains. I wore my new briefs and worked up to 5 sets of 3. 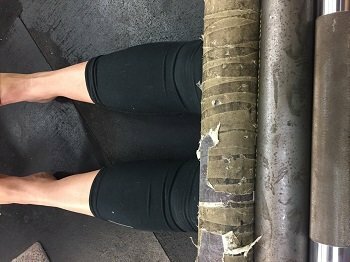 I also did some body tempering on Tuesday. We have two of the smaller pieces plus a boomstick and I used the boomstick and one body tempering piece for 5 minutes on my quads and then I did all three pieces for 5 minutes on my quad. I also did 5 minutes with one piece and the boomstick on my Psoas for 5 minutes. I have found that once I can relax under the weight and begin to breath slowly into my belly that I can feel the jacked up connections in my body also start to relax and release. I think it has helped me be able to continue with the prowler and sled without my hips getting super tight.